To the best of my knowledge this catapult project is different from any others you may have heard about. For a historically defined machine of this class and size, the one you see below is the most comprehensively tested, powerful, long-ranged, and accurate shooting ballista made since ancient times. No brag, just fact. * Her name is Firefly. This blog is a journal of how she came to be. The impressive work of the Pumpkin Chunkers may seem like an obvious counter to this bold claim. However, they are working with an unlimited class of machine that is not concerned with matters of historical fidelity. 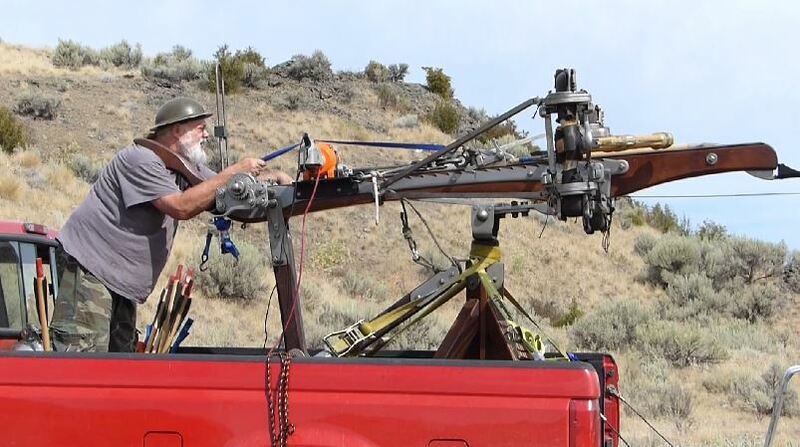 This journal details the day to day efforts it took to make a formidable, Fourth Century Roman ballista that did not stray outside the dimensional constraints of the artifacts it is based on. Like any modern catapult reconstruction, Firefly is not a perfect duplication of the original machine. Which is hardly possible as there are no intact ancient catapults, just rusty old bits and pieces, and a few original texts that are inadequate in explaining how these machines achieved their reputedly high performance. A word about my sometimes flippant tone — I’ve only got so much happy in me for this kind of trial and error marathon. I find a certain amount of glibness necessary to keep buoyant after so many setbacks. Hopefully it doesn’t belie too much of the actual work. And with that, here is the continuing saga of Firefly and our new machine, Phoenix…..
* Believe it or not, I really would appreciate it if someone would refute this claim. Numbers, please. Comments section is open. The two postings below will provide newcomers a glimpse into what this project is all about. They are a little older and are presented out of sequence. For the latest postings please go to the menu on the right and check out our other categories. Day one of the project defines the historical origins of this device and is easily accessible by clicking in the archives. Actually reading through the rest of the days — that will take some stamina…. 9:03 pm, 9 September, 2015 р.
Thats a great article that Don Hitchcock wrote. Its nice to read it again, its a good boil down and it shows some key pictures all on one page. I’m glad Washington had rain. I have an idea for a less travel to target, but it’s only half baked. 11:15 pm, 9 September, 2015 р.
I agree, Don did a very nice job with his write up. Must contact him soon. An idea? Half baked? Just up my alley, go on….